En este tour, ve detrás de las escenas en una bodega clásica de Montepulciano, prueba sus numerosas añadas y disfruta de una comida tradicional de la Toscana. Elija entre las opciones de almuerzo o cena y asegúrese de venir con hambre: el menú de varios platos incluye quesos locales, pasta y más. 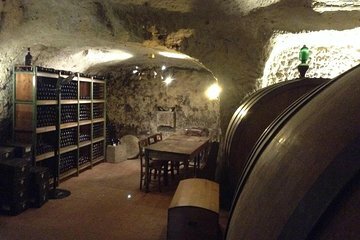 También visitará la bodega (una antigua tumba etrusca), disfrutará los sabores del Vino Nobile di Montepulciano y otras variedades locales, y aprenderá más sobre cómo se hace el vino. Disfrute de una comida de varios platos de platos tradicionales de la Toscana. Food and service were good but there were absolutely no explanations on the history or profiles of the wine. We were simply served and told the year. It was like eating in any other restaurant. To make matters worse, my wife and I suffered food poisoning after. Also no tour of the wine cellars. Our group of 4 had a fabulous time at Cantina Gattavecchi . Our evening started with a tour of the family owned winery and caves in the refectory of the 13th century Convent of santa Maria die Servi, followed by an amazing 4 course dinner, each course paired with a specially chosen wine. The entire family made us feel very welcome as they stopped by our table to introduce themselves and chat bout there wines and cantina. if you're looking for a special evening while staying in Montepulciano, we highly suggest taking part in this lovely pairing. We are back in the USA now and are enjoying our wine selection that we had shipped home.